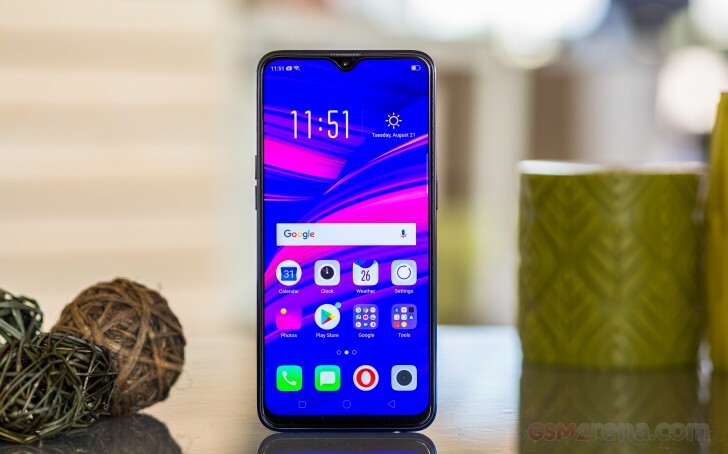 The Oppo F9 packs a 6.3" IPS LCD screen of 1080p resolution with a very decent pixel density of 409ppi. The native resolution is 1,080 x 2,340 - that's 19.5:9 aspect - one of the tallest among the most recent smartphones. While we've seen other screens of such tall ratio, they typically have much larger notches, so the usable area is still close the 18:9 ratio of yesteryear. Here however the waterdrop notch leaves more of the height available to the UI. The Oppo F9/F9 Pro display proved to be an excellent performer in our display test, pumping out north of 520 nits of maximum brightness. Combined with the deep blacks the F9's display posted an excellent contrast of 1800:1. The minimum brightness level of 3.4 nits is also nice, meaning you can comfortably use it in complete darkness. The Oppo F9 did well in our sunlight legibility test, posting a fine score for an LCD panel. In real-world terms, the handset remains perfectly usable outdoors. The color rendering is all over the place with an average deltaE of 6.9 and maximum deviation of 12.3 at point white - the screen has a noticeable blue tint and everything looks colder than it should be. If you set the color temperature all the way to Warmer end of the temperature slider, you'll get one more accurate color presentation with an average deltaE of 4.9 and maximum deviation ot 7.8 at point white (still towards blue). The Oppo F9 is powered by a large 3,500 mAh battery. It offers Oppo's custom solution called VOOC Flash Charging and requires using the bundled 20W charger and special cable combo, which can be limiting. The 20W adapter can bring the Oppo F9 battery from 0% to about 57% in around 30 minutes, which is quite rapid. The Oppo F9 scored an excellent result in our battery test with a 94-hour Endurance rating. It did a great job in all tested scenarios - video playback, calls, web browsing and even stand-by performance. Our endurance rating denotes how long a single battery charge will last you if you use the Oppo F9 for an hour each of telephony, web browsing, and video playback daily. We've established this usage pattern, so our battery results are comparable across devices in the most common day-to-day tasks. The battery testing procedure is described in detail in case you're interested in the nitty-gritties. You can also check out our complete battery test table, where you can see how all of the smartphones we've tested will compare under your own typical use. There is one speaker on the Oppo F9, and it's at the bottom. It posted a Very Good score in our loudness test - 2db shy of the Excellent mark. The sound quality is excellent with rich and deep sound. Oppo F9 did great when hooked to an active external amplifier - it delivered very loud output that was perfectly accurate too. There's really little else we could want here. Plugging in a pair of headphones delivered a blow to volume levels, which sunk to average levels. Some intermodulation distortion and a moderate amount of stereo crosstalk crept in too, so the performance is not really worth writing home about here. It should still do just fine if you are not a huge audiophile, though.